(CNN) -- In a speech from George Mason University in Fairfax, Virginia, on Thursday, President-elect Barack Obama called on Congress to act quickly on his economic package. The following is a transcript of his prepared remarks. 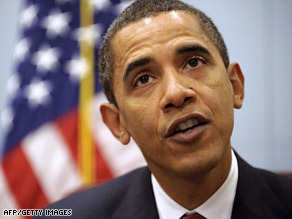 Barack Obama says failure to act quickly on his economic plan would have devastating consequences. Obama: Let me begin by thanking George Mason University for their extraordinary hospitality and to thank all the great friends, the governors, the mayors who are in attendance here today. Throughout America's history, there have been some years that simply rolled into the next without much notice or fanfare. And then there are the years that come along once in a generation, the kind that mark a clean break from a troubled past and set a new course for our nation. This is one of those years. We start 2009 in the midst of a crisis unlike any we have seen in our lifetime, a crisis that has only deepened over the last few weeks. Nearly 2 million jobs have been now lost. And on Friday, we're likely to learn that we lost more jobs last year than at any time since World War II. Just in the past year, another 2.8 million Americans who want and need full-time work have had to settle for part-time jobs. Manufacturing has hit a 28-year low. Many businesses cannot borrow or make payroll. Many families cannot pay their bills or their mortgage. Many workers are watching their life savings disappear. And many, many Americans are both anxious and uncertain of what the future will hold. Now, I don't believe it's too late to change course, but it will be if we don't take dramatic action as soon as possible. If nothing is done, this recession could linger for years. The unemployment rate could reach double digits. Our economy could fall $1 trillion short of its full capacity, which translates into more than $12,000 in lost income for a family of four. We could lose a generation of potential and promise as more young Americans are forced to forgo dreams of college or the chance to train for the jobs of the future. And our nation could lose the competitive edge that has served as a foundation for our strength and our standing in the world. This crisis did not happen solely by some accident of history or normal turn of the business cycle. And we won't get out of it by simply waiting for a better day to come or relying on the worn-out dogmas of the past. We arrived at this point due to an era of profound irresponsibility that stretched from corporate board rooms to the halls of power in Washington, D.C.
For years, too many Wall Street executives made imprudent and dangerous decisions, seeking profits with too little regard for risk, too little regulatory scrutiny, and too little accountability. Banks made loans without concern for whether borrowers could repay them, and some borrowers took advantage of cheap credit to take on debt they couldn't afford. Politicians spent taxpayer money without wisdom or discipline and too often focused on scoring political points instead of problems they were sent here to solve. The result has been a devastating loss of trust and confidence in our economy, our financial markets and our government. Now, the very fact that this crisis is largely of our own making means that it's not beyond our ability to solve. Our problems are rooted in past mistakes, not our capacity for future greatness. It will take time -- perhaps many years -- but we can rebuild that lost trust and confidence. We can restore opportunity and prosperity. We should never forget that our workers are still more productive than any on Earth. Our universities are still the envy of the world. We are still home to the most brilliant minds, the most creative entrepreneurs, and the most advanced technology and innovation that history has ever known. And we are still the nation that has overcome great fears and improbable odds. If we act with the urgency and seriousness that this moment requires, I know that we can do it again. That is why I have moved quickly to work with my economic team and leaders of both parties on an American Recovery and Reinvestment Plan that will immediately jump-start job creation and long-term growth. It's a plan that represents not just new policy, but a whole new approach to meeting our most urgent challenges. For if we hope to end this crisis, we must end the culture of "anything goes" that helped create it, and this change must begin in Washington. It's time to trade old habits for a new spirit of responsibility. It's time to finally change the ways of Washington so that we can set a new and better course for America. There is no doubt that the cost of this plan will be considerable. It will certainly add to the budget deficit in the short term. But equally certain are the consequences of doing too little or nothing at all, for that will lead to an even greater deficit of jobs, incomes and confidence in our economy. It is true that we cannot depend on government alone to create jobs or long-term growth. But at this particular moment, only government can provide the short-term boost necessary to lift us from a recession this deep and severe. Only government can break the cycle that is crippling our economy, where a lack of spending leads to lost jobs, which leads to even less spending, where an inability to lend and borrow stops growth and leads to even less credit. That's why we need to act boldly and act now to reverse these cycles. That's why we need to put money in the pockets of the American people, create new jobs and invest in our future. That's why we need to restart the flow of credit and restore the rules of the road that will ensure a crisis like this never happens again. This plan begins with -- this plan must begin today, a plan I'm confident will save or create at least 3 million jobs over the next few years. It's not just another public works program. It's a plan that recognizes both the paradox and promise of this moment: the fact that there are millions of Americans trying to find work, even as all around the country, there's so much work to be done. And that's why we'll invest in priorities like energy and education, health care and a new infrastructure that are necessary to keep us strong and competitive in the 21st century. That's why the overwhelming majority of the jobs created will be in the private sector, while our plan will save the public sector jobs of teachers, police officers, firefighters, and others who provide vital services. To finally spark the creation of a clean energy economy, we will double the production of alternative energy in the next three years. We will modernize more than 75 percent of federal buildings and improve the energy efficiency of 2 million American homes, saving consumers and taxpayers billions on our energy bills. In the process, we will put Americans to work in new jobs that pay well and can't be outsourced, jobs building solar panels and wind turbines, constructing fuel-efficient cars and buildings, and developing the new energy technologies that will lead to even more jobs, more savings, and a cleaner, safer planet in the bargain. To improve the quality of our health care while lowering its cost, we will make the immediate investments necessary to ensure that, within five years, all of America's medical records are computerized. This will cut waste, eliminate red tape and reduce the need to repeat expensive medical tests. But it just won't save billions of dollars and thousands of jobs; it will save lives by reducing the deadly but preventable medical errors that pervade our health care system. To give our children the chance to live out their dreams in a world that's never been more competitive, we will equip tens of thousands of schools, community colleges and public universities with 21st-century classrooms, labs and libraries. We'll provide new computers, new technology and new training for teachers so that students in Chicago and Boston can compete with children in Beijing for the high-tech, high-wage jobs of the future. To build an economy that can lead this future, we will begin to rebuild America. Yes, we'll put people to work repairing crumbling roads, bridges and schools, by eliminating the backlog of well- planned, worthy and needed infrastructure projects, but we'll also do more to retrofit America for a global economy. That means updating the way we get our electricity, by starting to build a new smart grid that will save us money, protect our power sources from blackout or attack, and deliver clean, alternative forms of energy to every corner of our nation. It means expanding broadband lines across America so that a small business in a rural town can connect and compete with their counterparts anywhere in the world. It means investing in the science, research and technology that will lead to new medical breakthroughs, new discoveries and entire new industries. And, finally, this Recovery and Reinvestment Plan will provide immediate relief to states, workers, and families who are bearing the brunt of this recession. To get people spending again, 95 percent of working families will receive a $1,000 tax cut, the first stage of a middle-class tax cut that I promised during the campaign and will include in our next budget. To help Americans who have lost their jobs and can't find new ones, we'll continue the bipartisan extension of unemployment insurance and health care coverage to help them through this crisis. Government at every level will have to tighten its belt, but we'll help struggling states avoid harmful budget cuts, as long as they take responsibility and use the money to maintain essential services, like police, fire, education and health care. Now, I understand that some might be skeptical of this plan. Our government has already spent a good deal of money, but we haven't yet seen that translate into more jobs, or higher incomes, or renewed confidence in our economy. And that's why the American Recovery and Reinvestment Plan won't just throw money at our problems. We'll invest in what works. The true test of policies we'll pursue won't be whether they're Democratic or Republican ideas, whether they're conservative or liberal ideas, but whether they create jobs, grow our economy and put the American dream within the reach of the American people. Instead of politicians doling out money behind a veil of secrecy, decisions about where we invest will be made transparently and informed by independent experts wherever possible. Every American will be able to hold Washington accountable for these decisions by going online to see how and where their taxpayer dollars are spent. And as I announced yesterday, we will launch an unprecedented effort to eliminate unwise and unnecessary spending that has never been more unaffordable for our nation and our children's future than it is right now. We have to make tough choices and smart investments today so that, as the economy recovers, the deficits start coming down. We cannot have a solid recovery if our people and our businesses don't have confidence that we're getting our fiscal house in order. And that's why our goal is not to create a slew of new government programs, but a foundation for long-term economic growth. That also means an economic recovery plan that is free from earmarks and pet projects. I understand that every member of Congress has ideas about how to spend money. Many of these projects are worthy; they benefit local communities. But this emergency legislation must not be the vehicle for those aspirations. This must be a time when leaders in both parties put the urgent needs of our nation above our own narrow interests. Now, this recovery plan alone will not solve all the problems that led us into this crisis. We must also work with the same sense of urgency to stabilize and repair the financial system we all depend on. That means using our full arsenal of tools to get credit flowing again to families and businesses, while restoring confidence in our markets. It means launching a sweeping effort to address the foreclosure crisis so that we can keep responsible families in their homes. It means preventing the catastrophic failure of financial institutions whose collapse could endanger the entire economy, but only with maximum protections for taxpayers and a clear understanding that government support for any company is an extraordinary action that must come with significant restrictions on the firms that receive support. And it means reforming a weak and outdated regulatory system so that we can better withstand financial shocks and better protect consumers, investors and businesses from the reckless greed and risk- taking that must never endanger our prosperity again. No longer can we allow Wall Street wrongdoers to slip through regulatory cracks. No longer can we allow special interests to put their thumbs on the economic scales. No longer can we allow the unscrupulous lending and borrowing that leads only to disruptive cycles of bubble and bust. It is time to set a new course for this economy, and that change must begin now. We should have an open and honest discussion about this recovery plan in the days ahead, but I urge Congress to move as quickly as possible on behalf of the American people, for every day we wait or point fingers or drag our feet, more Americans will lose their jobs, more families will lose their savings, more dreams will be deferred and denied, and our nation will sink deeper into a crisis that at some point we may not be able to reverse. That is not the country I know. It is not a future I accept as president of the United States. A world that depends on the strength of our economy is now watching and waiting for America to lead once more, and that is what we will do. It will not come easy or happen overnight. And it is altogether likely that things may get worse before they get better. But that is all the more reason for Congress to act without delay. I know the scale of this plan is unprecedented, but so is the severity of our situation. We have already tried the wait-and-see approach to our problems, and it is the same approach that helped lead us to this day of reckoning. And that is why the time has come to build a 21st-century economy in which hard work and responsibility are once again rewarded. That's why I'm asking Congress to work with me and my team day and night -- on weekends, if necessary -- to get the plan passed in the next few weeks. That's why I'm calling on all Americans, Democrats and Republicans and independents, to put -- to put good ideas ahead of the old ideological battles, a sense of common purpose above the same narrow partisanship, and insist that the first question each of us asks isn't "What's good for me?" but "What's good for the country my children will inherit?" More than any program or policy, it is this spirit that will enable us to confront these challenges with the same spirit that has led previous generations to face down war and depression and fear itself. And if we do, if we are able to summon that spirit again, if we are able to look out for one another and listen to one another, and do our part for our nation and for posterity, then I have no doubt that, years from now, we will look back on 2009 as one of those years that marked another new and hopeful beginning for the United States of America.